Dealer Info | Beck's Trailer Store | Michigan's Largest Trailer Dealer | New And Used Trailers For Sale And Rent. When Dad opened the marina back in 1960, being on Highway US-27 brought us up to date on just how important it was to go over and above in keeping our customers satisfied. Imagine going from selling bags of apples to snowmobiles, pontoons, boats, parts and then claiming top honors in North America for Evinrude outboard boat engines in just our first couple years in business. We quickly learned more than just how to treat people properly, we also began to see the importance of offering "Quality" products and services to really create TRULY happy and satisfied customers. In the 1980's, just like many, we were avid ATV, motorcycle and snowmobile enthusiasts. 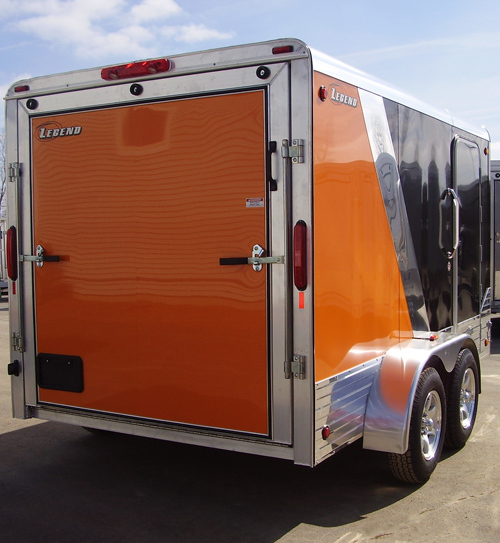 The trailers we sold were the same goosenecks, car trailers, dump trailers, equipment haulers, ATV Trailers and utility trailers we were using to transport our vehicles. They were not holding up. We began to experience product failures, down time, excessive wear on our tow vehicles and most importantly, not being taking care of by the manufacturers. Our Beck's staff put in exhaustive efforts to make happy customers, while the manufacturers were not standing behind their products. This became very frustrating and downright unacceptable. Many customers would visit us each year at the big NOVI show, and we started seeing more and more people upset with the products we were selling. Product failure, manufacturers not standing behind their products, upset customers, and a sincere desire to turn all of this around, is what drove us to ONLY represent manufacturers who were legitimate, qualified, and who held a near perfect track record. It was crystal clear that we needed a better choice for the consumer as well as ourselves. See we ride and use just like you do. That is why we only carry top-rated trailer brands and offer a greater selection so you’ll' find the perfect trailer for every job and any budget. Our customers tell us they love the way we do it. On any day, you'll meet one of your fellow Michigan, Indiana, Ohio, Illinois, Wisconsin, New York, or Pennsylvania residents hooking up a trailer while you're here... because word has gotten out: "Buy from Beck's or Forever Wish You Had! We are proud to have earned a 99.7% customer satisfaction rating. We are easily located on highway US-127 about 9 miles north of St. Johns. By city: About 25 minutes north of Lansing, 1 hour east of Grand Rapids, 1 hour southwest of Saginaw and Midland, 1 hour south of Mt. Pleasant. Only a few hours away from Ohio and Indiana.